Department of Immnochemistry, Research Institute for Microbial Diseases, Osaka University. Laboratory of Immunochemistry, WPI Immunology Frontier Research Center (IFReC), Osaka University. Tadahiro Suenaga graduated from the School of Medicine, Chiba University. He obtained his doctorate from the Department of Neurology, Graduate School of Medicine, Chiba University. He worked in the Department of Molecular Genetics, Graduate School of Medicine, Chiba University and Laboratory for Cell Signaling, RIKEN Research Center for Allergy and Immunology (RCAI) in the course of his doctoral studies. Since 2006 to the present, he worked in the Department of Immnochemistry, Research Institute for Microbial Diseases, Osaka University. From 2008 to the present, he has worked at the Laboratory of Immunochemistry, WPI Immunology Frontier Research Center (IFReC), Osaka University. Ph.D.: Graduate School of Medicine, Hokkaido University (1994). Research Associate: Department of Molecular Genetics, Center for Neurobiology and Molecular Immunology, School of Medicine, Chiba University, Chiba, Japan (1994-2000). Visiting Fellow: University of California San Francisco, San Francisco, CA, USA (2000-2002). Associate Professor: Department of Molecular Genetics, Chiba University Graduate School of Medicine, Chiba, Japan (2002-2004). Associate Professor: Department of Immunochemistry, Research Institute for Microbial Diseases, Osaka University, Osaka, Japan (2004-2006). Professor: Department of Immunochemistry, Research Institute for Microbial Diseases, Osaka University, Osaka, Japan (2006-present). Professor: Laboratory of Immunochemistry, WPI Immunology Frontier Research Center, Osaka University (2007-present). At present the author and his group are mainly working on the interaction between pathogens and the immune system. It has been suggested that many viruses use the sugar chain at various steps of infection. Some viruses utilize the sugar chain to enhance efficiency of entry into host cells by adsorption and condensing virus particles on the surface of cells. Other viruses use the sugar chain itself as an entry receptor. For example, it is well known that sialic acid (N-acetylneuraminic acid: NANA, Nu5Ac) on the host cell surface is used as an entry receptor of hemagglutinin antigen (HA) during influenza virus infection. It has also been reported recently that adenovirus type 37 uses GD1a, a specific ganglioside (a kind of sphingoglycolipid carrying a carbohydrate chain bound with sialic acid) when the virus enters keratoconjunctiva1. The sugar chain is involved in virus infection in various ways as noted above. 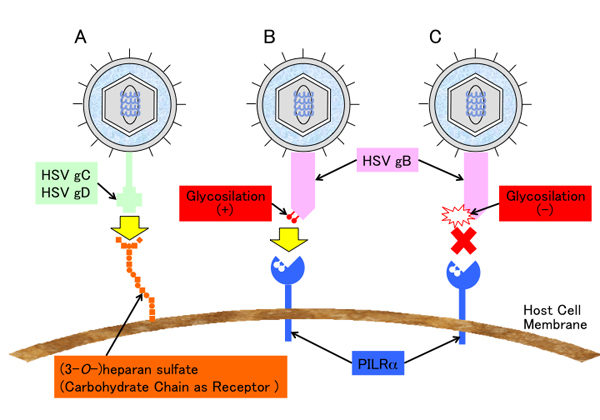 Here, we describe how the sugar chain functions during herpes virus infection. The human herpes virus family consists of human herpes virus-1 to -8. Herpes simplex virus-1 and -2 (HSV-1 and -2) and Varicella-zoster virus (VZV) belong to the α-herpes virus subfamily (Table). The herpes virus particle is composed of linear double-stranded DNA included in an icosahedral capsid, which is surrounded by a tegument and envelope (Fig. 1A). Human Herpes Virus (HHV) is classified into the α-, β-, or γ-herpesvirus subfamily. (A) Scheme of the human herpes virus. (B) Enveloped viruses have two routes (①direct fusion of virus envelope with host cell membrane, ② fusion of virus envelope with endosomal membrane after endocyosis) to enter host cells. Fusion caused by the association of glycoprotein on the envelope with the receptor on the cellular membrane is indispensable for virus entry whichever route the virus takes. To enter host cells, herpes virus particles first adsorb onto the host cell surface. It has been suggested that there are two routes of entry into host cells after adsorption. One route is the direct fusion pathway. The viral envelope fuses with the cell membrane directly mediated by the interaction of glycoprotein molecules on the envelope and cellular receptors. The other route is the endocytosis pathway. The virus is endocytosed, followed by viral envelope fusion with the endosome membrane. After fusion, the viral capsid can enter the cytosol (Fig. 1B)2. The capsid binds to microtubules and is transported toward the nucleus. Then viral DNA can be incorporated into the host cell nucleus after the capsid is uncoated while passing through the nuclear membrane. Therefore, the cellular molecule, which can cause fusion of the envelope with the cellular membrane and allow the virus to enter host cells, can be called an entry receptor. It is suggested that HSV-1 is the prototype virus of all herpes viruses. HSV-1 has homology as high as 50% with HSV-2 in genome, but the genomic and phenotypical characteristics of HSV-1 are different from the other six herpes virus types. HSV-1 can infect various tissues and actually cause keratitis, labialis, encephalitis and genital herpes. It is estimated that about eight million people suffer from HSV-1. HSV-2 is well known to cause genital herpes and in Japan 72,000 people yearly consult physicians for this disease. The pathogenic virus of genital herpes is not only HSV-2 but also HSV-1. HSV latently infects sensory ganglia after primary infection and reactivates, resulting in repeated dermatitis with vesication when patients are in a immunodeficient state. Some glycoproteins on the HSV-1 and -2 envelope are involved in virion adsorption on the host cell surface prior to entry. It has been suggested that the association of glycoprotein C (gC) with heparan sulfate ptoteoglycans (HSPGs) is involved in adsorption of HSV3. Cells have protrusions used for cell migration such as filopodia. It has been suggested that virions can enter host cells by the process called as “viral surfing” when virus adsorbs those protrusions4, 5 . Viral surfing is a phenomenon by which virions enter host cells at the cell body, where the virus can easily enter, after virions are carried on the surface of host cells from those cell protrusions toward the cell body. It has been reported that viral surfing occurs not only among retrovirus and human papilloma virus but also among HSV-1, human cytomegalovirus (HCMV) and Kaposi’s sarcoma-associated herpes virus. HSV-1 gC plays an important role in virion adsorption even during viral surfing. However, HSV gC is not an essential molecule because gC is not involved in envelope-membrane fusion and virus entry. 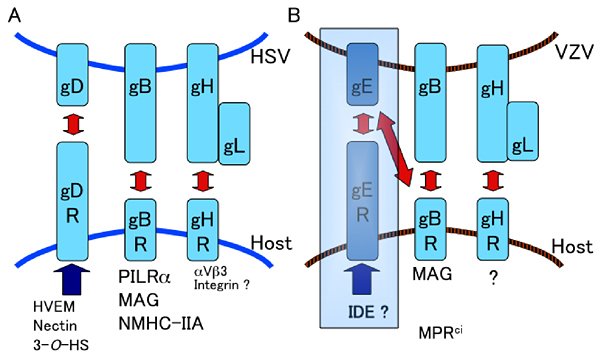 gB, gD, gH and gL are essential and indispensable for HSV to enter host cells. It has been reported that gD associates with Nectin-1, HVEM (herpes virus entry mediator) and 3-O-HS (3-O-sulfated heparan sulfate) 6-8. Nectin-1 is mainly involved in cell adhesion. HVEM expresses on T cells, B cells, monocyte and dendritic cells and is a type I membrane protein belonging to the TNF receptor family. While HVEM is a receptor for LIGHT and lymphotoxin-α (LTα) and co-stimulates HVEM-expressing cells by transduction of activating signal, HVEM is also a ligand for BTLA (B and T lymphocyte attenuator) and CD160 and inhibits activation of T cells and B cells by transducing inhibitory signal9, 10 . We identified paired immunoglobulin-like type 2 receptor α (PILRα) as a molecule associating with HSV gB. Furthermore, PILRα expressing cells can fuse with cells expressing HSV gB, gD, gH and gL. During HSV-1 infection of PILRα-expressing cells such as human monocytes, blocking either interaction between gB and PILRα or interaction between gD and HVEM by anti-PILRα monoclonal antibody or by anti-HVEM monoclonal antibody inhibits HSV-1 infection. From these findings, it is considered that PILRα is an entry receptor of HSV and co-functions with the gD receptor, HVEM, by associating with gB during HSV infection of monocytes (Fig. 2A)11, 12 . PILR are membrane molecules expressing on monocytes and granulocytes. PILR consists of PILRα, which possesses ITIM (immunoreceptor tyrosine-based inhibitory motif) and transduces negatively regulated signal and of PILRβ, which transduces activating signal by association with DAP12 carrying ITAM (immunoreceptor tyrosine-based activation motif) 13. Both mouse PILRα and PILRβ are considered to recognize CD99 and regulate immune reaction14, 15 . However, human PILRβ does not associate with HSV-1 or -2 gB because Trp139 is substituted for Leu unlike human PILRα. Thus ligands of human PILRβ have not been identified16. O-glycosylation of both Thr45 and Thr50 is indispensable for the recognition of CD99 by PILR. However, PILRα binds not only with the carbohydrate chain but recognizes both carbohydrate structure and protein structure15. When another PILRα ligand, PILR-associating neural protein (PANP), which we have recently reported, is recognized by PILR, O-glycosylation of Thr83 on PANP is required17. When HSV gB was deprived of sialic acid by the treatment of gB expressing cells with sialidase (neuraminidase), gB was not recognized by PILRα. These results indicated that the binding of gB with PILRα requires sialic acid. Furthermore, while inhibition of N-glycosylation on gB by the treatment of gB-expressing cells with Tunicamycin could not affect the association of gB with PILRα, inhibition of O-glycosylation with treatment by benzyl-GalNac abrogated the association of gB with PILRα. From a study using gB with mutation in predicted amino acids to be O-glycosylated, O-glycosylation of Thr53 and 480Thr on gB were important for the association with PILRα. The former amino acid was more important for binding than the latter18. Since HSV-1 substituted of these threonines on gB with alanine showed lower infectivity mediated by PILRα than wild type HSV-1, we believe that the association of PILRα with gB via sialic acid on O-carbohydrate chains of gB is indispensable for HSV-1 infection mediated by PILRα. Indeed, morbidity of mice infected with HSV-1 possessing mutated gB to not associate with PILRα was significantly lower than those infected with wild type HSV-119. VZV infects T cells, dendritic cells and monocytes in tonsils via airborne transmission. The virus is carried by these infected cells throughout the body and causes varicella (chickenpox) mainly in children during primary infection. VZV as well as HSV latently infect in sensory ganglia and reactivate in immunodeficient or in elderly people resulting in zoster (shingles). VZV also causes encephalitis, myelitis, cranial neuritis such as Ramsay-Hunt syndrome and vasculopathy in cerebral arteries. gB, gE, gH and gL have been considered to be essential for VZV infection20. Regarding cellular molecules involved in VZV entry, it has been reported that cation-independent mannose-6-phosphate receptor (MPRci) enhances VZV infection21. However, it is unclear which molecule of VZV associates with MPRci. It has also been reported that gE associates with insulin degrading enzyme (IDE) and promotes VZV infection22. However, because neither IDE nor MPRci could cause membrane fusion in our study, IDE and MPRci cannot be called entry receptors of VZV. (A) HSV, (B) VZV glycoproteins, which are required for entry and fusion associate with corresponding cellular entry receptors. VZV gE has been suggested to be required for entry and fusion. From our study, however, gE is not indispensable for fusion although gE is essential for VZV. HVEM: Herpes virus entry mediator, 3-O-HS: 3-O-sulfated heparan sulfate, PILRα: Paired immunoglobulin-like type 2 receptor α, MAG: Myelin-associated glycoprotein, NMHC-IIA: Non-muscle myosin heavy chain IIA, MPRci: cation-independent mannose-6-phosphate receptor, IDE: insulin degrading enzyme. Since VZV belongs to the α-herpesvirus subfamily as well as HSV-1, we investigated molecules homologous to PILRα to be candidates for VZV gB receptor. We found that myelin-associated glycoprotein (MAG) has 12% homology with PILRα in the amino acid sequence. MAG is conserved from fishes to mammals and is a type I membrane protein of 100 kDa. MAG expresses in nerve tissues and is involved in the configuration of nerve tissues by inhibition of axonal growth mediated by interaction with NgR1 (Nogo Receptor 1), NgR2, paired Ig-like receptor B (PIR-B) and gangliosids such as GD1a or GT1b 23, 24 . With regard to the physiological ligands of MAG, it remains unclear whether the ligands are proteins such as NgR1, NgR2 and PIR-B, carbohydrate chains on gangliosids or both, because the results differ in reports in which axons used in experiments of axonal growth-inhibition are derived from various nerve tissues25. Interestingly, the fusion protein of extracellular domain of MAG with human immunoglobulin Fc portion (MAG-Ig) associated not only with VZV gB expressing cells but also with VZV gE expressing cells. Conversely, both VZV gB-Ig and gE-Ig associated with MAG expressing cells. Although MAG associated with VZV gB and gE, MAG expressing cells fused with cells expressing gB, gE, gH and gL as much as with cells expressing gB, gH and gL, it did not associate with cells expressing gE, gH and gL. These results suggest that the set of VZV gB, gH and gL causes membrane fusion unlike the conventional theory that gB, gE, gH and gL are required for fusion of VZV. Furthermore, MAG expressing cells were sensitive to VZV, and VZV infection mediated by MAG was inhibited specifically by anti-MAG monoclonal antibody. From these results, we reported that MAG is an entry receptor for VZV, which associates with VZV gB and causes membrane fusion (Fig. 2B)26. Since gE is an essential molecule for VZV, it is assumed that IDE and MPRci are involved in an infection process other than fusion. Tissue tropism of virus is determined by a number of factors. One important factor is whether the virus can enter the target tissue. For example, T cell or macrophage tropism of HIV depends upon entry receptors such as CD4, CXCR4 or CCR5. HVEM, Nectin-1, 3-O-HS, IDE and MPRci have been suggested to be host cellular molecules involved in HSV or VZV infection. However, HSV and VZV tropism for nerve tissues has not been sufficiently elucidated since these molecules are distributed ubiquitously. Interestingly, we found that HSV-1 gB also associated with MAG and fusion was caused by this association. Since MAG expresses limitedly in nerve tissues, we suggested that MAG is an entry receptor of HSV and VZV, which is involved in tropism for nerve tissues26. Conversely, when HSV infects tissues other than nerve tissue, it is presumed that HSV uses a known gD receptor such as HVEM, Nectin-1 or 3-O-HS as well as a gB receptor such as PILRα or non-muscle myosin heavy chain IIA (NMHC-IIA) expressing ubiquitously27. VZV entry receptor, which expresses in tissues other than nerve such as skin and hematopoietic cells and associates with gB, has not been reported. Thus, VZV might infect tissues other than nerve tissue via an unknown gB receptor. Proteins which recognize carbohydrate chains and do not include enzymes and antibodies are called lectin (GlycoWord, "Lectin"). As examples of the relation between virus and lectin, HIV, SARS-corona virus and measles virus associate with DC-SIGN belonging to the C-type lectins28. Galectin-1, which has been reported to promote HIV and HTLV-1 infection is involved in S-type lectins29. In addition, MPRci, which enhances VZV infection, is contained in P-type lectins. It has been elucidated that lectins are important for interaction with virus as written above. While siglec-1 belonging to I-type lectins has been recently reported to adsorb HIV and porcine reproductive and respiratory wyndrome virus (PRRSV), it remains unclear whether other siglecs (sialic acid-binding immunoglobulin-like lectins) are related to virus infection30. MAG, also called Siglec-4, is a type I membrane protein and siglecs possess 1 or 2 of V-set immunoglobulin-like domains followed by 1 to 16 C2-set domains31, 32 (GlycoWord, Siglecs). Siglecs recognize various carbohydrate chains including sialic acids by a V-set immunoglobulin-like domain. In human, Siglecs-1 to -16 have been identified but Siglec-13 is missing. Siglec-XII cannot recognize sialic acid because of the mutation of Arg in the V-set domain. Since siglecs have the property of recognition of target molecules via sialic acids, we assume that sialic acid is involved in the association of MAG with gB (Suenaga et al. unpublished data). As noted above, it is probable that sialic acids are involved in HSV and VZV infection mediated by MAG. PILRα possesses an immunoglobulin-like domain and requires sialic acid on the ligands such as HSV gB, CD99 and PANP to bind them. In this respect, PILRα seems to be a molecule homologous to siglecs. Indeed, MAG was found in the search for a molecule homologous to PILRα. Therefore, it is probable that some virus other than HSV, VZV, HIV or PRRSV associates with siglecs and utilizes siglecs for entry. Clarification of the interaction between siglec molecules and viruses is expected to elucidate the mechanism of virus infection. With respect to the relation of virus infection to carbohydrate chains, it is important that sugar chains on the host cell surface function as virus entry or virus adsorption receptors. Furthermore, carbohydrate chains on virus proteins (i.e. HSV gB, influenza virus HA, HIV gp120, hepatitis C virus E1 and E2, West Nile virus E, SARS-CoV S and M and Ebola virus GP), which are involved in tissue tropism and in evasion from host immune responses, are also crucial to the analysis of virus infection (Fig. 3)33. 1. Nilsson, E.C., Storm, R.J., Bauer, J., Johansson, S.M., Lookene, A., Ǻngström, J., Hedenström, M., Eriksson, T.L., Frängsmyr, L., Rinaldi, S., Willison, H.J., Pedrosa Domellöf, F., Stehle, T., Arnberg, N. The GD1a glycan is a cellular receptor for adenoviruses causing epidemic keratoconjunctivitis. Nat Med 17, 105-109, 2011. 2. Marsh, M., Helenius, A. Virus entry: open sesame. Cell 124, 729-740, 2006. 3. Spear, P.G. Herpes simplex virus: receptors and ligands for cell entry. Cell Microbiol 6, 401-410, 2004. 4. Lehmann, M.J., Sherer, N.M., Marks, C.B., Pypaert, M., Mothes, W. Actin- and myosin-driven movement of viruses along filopodia precedes their entry into cells. J Cell Biol 170, 317-325, 2005. 5. Akhtar, J., Shukla, D. Viral entry mechanisms: cellular and viral mediators of herpes simplex virus entry. FEBS J 276, 7228-7236, 2009. 6. Montgomery, R.I., Warner, M.S., Lum, B.J., Spear, P.G. Herpes simplex virus-1 entry into cells mediated by a novel member of the TNF/NGF receptor family. Cell 87, 427-436, 1996. Geraghty, R.J., Krummenacher, C., Cohen, G.H., Eisenberg, R.J., Spear, P.G. Entry of alphaherpes viruses mediated by poliovirus receptor-related protein 1 and poliovirus receptor. Science 280, 1618-1620, 1998. 8. Shukla, D., Liu, J., Blaiklock, P., Shworak, N.W., Bai, X., Esko, J.D., Cohen, G.H., Eisenberg, R.J., Rosenberg, R.D., Spear, P.G. A novel role for 3-O-sulfated heparan sulfate in herpes simplex virus 1 entry. Cell 99, 13-22, 1999. 9. Šedý, J.R., Spear, P.G., Ware, C.F. Cross-regulation between herpes viruses and the TNF superfamily members. Nat Rev Immunol 8, 861-873, 2008. 10. Cai, G., Freeman, G.J. The CD160, BTLA, LIGHT/HVEM pathway: a bidirectional switch regulating T-cell activation. Immunol Rev 229, 244-258, 2009. 11. Satoh, T., Arii, J., Suenaga, T., Wang, J., Kogure, A., Uehori, J., Arase, N., Shiratori, I., Tanaka, S., Kawaguchi, Y., Spear, P.G., Lanier, L.L., Arase, H. PILRα is a herpes simplex virus-1 entry coreceptor that associates with glycoprotein B. Cell 132, 935-944, 2008. 12. Fan, Q., Lin, E., Satoh, T., Arase, H., Spear, P.G. Differential effects on cell fusion activity of mutations in herpes simplex virus 1 glycoprotein B (gB) dependent on whether a gD receptor or a gB receptor is overexpressed. J Virol 83, 7384-7390, 2009. 13. Fournier, N., Chalus, L., Durand, I., Garcia, E., Pin, J.J., Churakova, T., Patel, S., Zlot, C., Gorman, D., Zurawski, S., Abrams, J., Bates, E.E., Garrone, P. FDF03, a novel inhibitory receptor of the immunoglobulin superfamily, is expressed by human dendritic and myeloid cells. J Immunol 165, 1197-1209, 2000. 14. Shiratori, I., Ogasawara, K., Saito, T., Lanier, L.L., Arase, H. Activation of natural killer cells and dendritic cells upon recognition of a novel CD99-like ligand by paired immunoglobulin-like type 2 receptor. J Exp Med 199, 525-533, 2004. 15. Wang, J., Shiratori, I., Satoh, T., Lanier, L.L., Arase, H. An essential role of sialylated O-linked sugar chains in the recognition of mouse CD99 by paired Ig-like type 2 receptor (PILR). J Immunol 180, 1686-1693, 2008. 16. Fan, Q., Longnecker, R. The Ig-like v-type domain of paired Ig-like type 2 receptor alpha is critical for herpes simplex virus type 1-mediated membrane fusion. J Virol 84, 8664-8672, 2010. 17. Kogure, A., Shiratori, I., Wang, J., Lanier, L.L., Arase, H. PANP is a novel O-glycosylated PILRalpha ligand expressed in neural tissues. Biochem Biophys Res Commun 405, 428-433, 2011. 18. Wang, J., Fan, Q., Satoh, T., Arii, J., Lanier, L.L., Spear, P.G., Kawaguchi, Y., Arase, H. Binding of herpes simplex virus glycoprotein B (gB) to paired immunoglobulin-like type 2 receptor alpha depends on specific sialylated O-linked glycans on gB. J Virol 83, 13042-13045, 2009. 19. Arii, J., Wang, J., Morimoto, T., Suenaga, T., Akashi, H., Arase, H., Kawaguchi, Y. A single-amino-acid substitution in herpes simplex virus 1 envelope glycoprotein B at a site required for binding to the paired immunoglobulin-like type 2 receptor alpha (PILRalpha) abrogates PILRalpha-dependent viral entry and reduces pathogenesis. J Virol 84, 10773-10783, 2010. 20. Cole, N.L., Grose, C. Membrane fusion mediated by herpes virus glycoproteins: the paradigm of varicella-zoster virus. Rev Med Virol 13, 207-222, 2003. 21. Chen, J.J., Zhu, Z., Gershon, A.A., Gershon, M.D. Mannose 6-phosphate receptor dependence of varicella zoster virus infection in vitro and in the epidermis during varicella and zoster. Cell 119, 915-926, 2004. 22. Li, Q., Ali, M.A., Cohen, J.I. Insulin degrading enzyme is a cellular receptor mediating varicella-zoster virus infection and cell-to-cell spread. Cell 127, 305-316, 2006. 23. Quarles, R.H. A hypothesis about the relationship of myelin-associated glycoprotein's function in myelinated axons to its capacity to inhibit neurite outgrowth. Neurochem Res 34, 79-86, 2009. 24. Hines, J.H., Abu-Rub, M., Henley, J.R. Asymmetric endocytosis and remodeling of beta1-integrin adhesions during growth cone chemorepulsion by MAG. Nat Neurosci 13, 829-837, 2010. 25. Lopez, P.H., Schnaar, R.L. Gangliosides in cell recognition and membrane protein regulation. Curr Opin Struct Biol 19, 549-557, 2009. 26. Suenaga, T., Satoh, T., Somboonthum, P., Kawaguchi, Y., Mori, Y., Arase, H. Myelin-associated glycoprotein mediates membrane fusion and entry of neurotropic herpes viruses. Proc Natl Acad Sci U S A 107, 866-871, 2010. 27. Arii, J., Goto, H., Suenaga, T., Oyama, M., Kozuka-Hata, H., Imai, T., Minowa, A., Akashi, H., Arase, H., Kawaoka, Y., Kawaguchi, Y. Non-muscle myosin IIA is a functional entry receptor for herpes simplex virus-1. Nature 467, 859-862, 2010. 28. Geijtenbeek, T.B., Gringhuis, S.I. Signalling through C-type lectin receptors: shaping immune responses. Nat Rev Immunol 9, 465-479, 2009. 29. Sato, S., St-Pierre, C., Bhaumik, P., Nieminen, J. Galectins in innate immunity: dual functions of host soluble beta-galactoside-binding lectins as damage-associated molecular patterns (DAMPs) and as receptors for pathogen-associated molecular patterns (PAMPs). Immunol Rev 230, 172-187, 2009. 30. Crocker, P.R., Redelinghuys, P. Siglecs as positive and negative regulators of the immune system. Biochem Soc Trans 36, 1467-1471, 2008. 31. Varki, A., Angata, T. Siglecs--the major subfamily of I-type lectins. Glycobiology 16, 1R-27R, 2006. 32. Crocker, P.R., Paulson, J.C., Varki, A. Siglecs and their roles in the immune system. Nat Rev Immunol 7, 255-266, 2007. 33. Vigerust, D.J., Shepherd, V.L. Virus glycosylation: role in virulence and immune interactions. Trends Microbiol 15, 211-218, 2007.